When you sit down to write out your wish list for your new home, it will probably include things like a big kitchen, three bedrooms, a finished basement, and a deck. It is easy to fall in love with a house with big, open rooms, newly painted walls, and a pristine lawn. However, it is very important that you look past the beautiful facade and keep your eyes open for some less glamorous details. If you allow yourself to choose a house based on the visuals, you could find your decision costing you dearly down the road. As you are admiring the elegant chair molding and the beautiful door walls, do not forget to find out how old the furnace is and when it was last inspected and serviced. An old or faulty furnace will not stand out when you tour the home, but it is a detail that can cost you a great deal of money within the first few years of home ownership if you do not handle this detail before the sale. If the furnace is old, you can take this into account when you make your offer. The classic look of wood frames around the windows may give the home character, but it could also be a sign that the windows have not been replaced with modern thermal windows. Older windows will cost a fortune in energy bills because they allow far more in air leakage than new vinyl replacement windows. If your dream home still has older windows, you may want to keep looking or consider the cost of replacement windows when making an offer on the house. 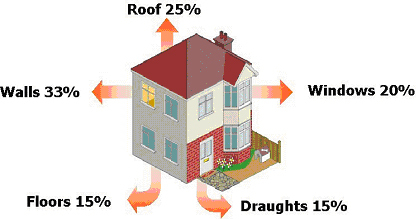 It can be difficult to assess the condition of the roof from the ground. Even if it leaks, there may be no evidence anywhere besides the attic. It is important to know how hold the roof is and to ensure that there is no damage, leaking, or sagging. Also, you will want to know if there is more than one roof on the house. In other words, you want to find out if the owners have placed a new roof on top of the old one. If there is more than one roof, or the current roof is over five years old, you will want to consider the cost of a new roof in the offer you make on the house, and you will want to have the home inspected for water damage before moving forward. If there is any room in the home with a new floor or newly painted walls, be sure to pay extra attention to that area. Sellers may choose to put down a new floor or put up a fresh coat of paint to mask water damage or structural issues. Of course, this is not always the case, but certainly you will want to call your home inspector’s attention to those areas. Buying a home with mold, a rotting foundation, or damaged walls can cause headaches and a huge financial loss in the long run.